Installing the Gapmaster is straightforward. These are suggested methods but by no means are the only methods. -- Note: HO Code 83 shown in this example with GM007 and MicroEngineering flextrack. -- on the workbench, flip the flextrack over and carefully remove 2 or 4 ties depending on the particular Gapmaster you are using (alternatively you can do this in-place on your roadbed). -- clean the underside of the rail only, with fine 0000 steel wool. This can also be done with pre-weathered rail. -- turn the track right-side-up, and place the Gapmaster under the rails in the open area. You may elect to tape down the track and Gapmaster to your workbench for ease of handling. -- apply heat to the top of the rail head using a Weller soldering gun; a 100W setting is generally sufficient for rail up to and including Code148. Be sure that the tip of the gun is new or newer, as older tips can take much longer to heat up, melting plastic ties. -- Apply a small amount of fine (0.025") rosin-flux silver-bearing solder to the joint between the rail base and the Gapmaster metal top. Do this to all joint areas, starting at the middle two ties and working outward. Remove heat as soon as the solder flows, to avoid damaging the plastic ties. Note: many modelers have had great success with resistance soldering units. -- Use a flat file to strike any solder residue off of the top of the railhead. -- clean with steel wool and a scratch brush. -- Cut gap(s) using a razor saw (such as those sold by X-Acto, #239) held firmly (preferred), a Dremel tool, or a jeweler's saw. To start the gaps using a razor, pull back gently but firmly while holding the saw blade stiffly vertical. -- Complete the cut by sawing through the rail base and very slightly into the fiberglas substrate. Take care to not nick nearby rails. Repeat for all rails. -- Use a scratch brush to remove any burrs that may be present. -- install on your roadbed. -- Install the Gapmaster in-line with your ties on your roadbed and glue down like any other ties. -- Ensure that the rails in that area are bare metal on the underside. Spike/glue your rails down. 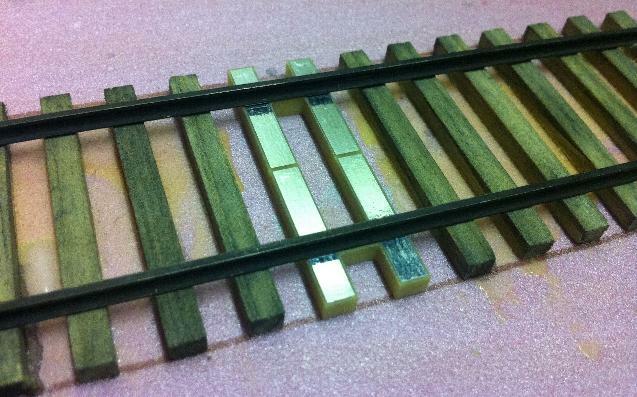 -- Solder rails and cut gaps in same manner as for Flextrack Installation.